My lovely and talented bloggy buddy Alexis from Tales from the Back Acher has pointed her finger at me to do a "Christmas tag"... so here goes! 1. Egg Nog or Hot Chocolate? I love them both, but egg nog gets the nod this time of year! 2. Does Santa wrap presents or just sit them under the tree? Definitely wrapped. 4. Do you hang mistletoe? YES! 6. What is your favorite holiday dish (excluding dessert)? I love all of it! But if I had to choose just one- cornbread dressing. I could live on a deserted island with a pan of that stuff and be as happy as could be. 7. Favorite holiday memory as a child? I have a large family and I remember being so excited about everybody being together on Christmas Eve. 9. Do you open a gift on Christmas Eve? Yes!! 10. How do you decorate your Christmas tree? I love lights, but I also love ribbons and bows and ornaments that have sentimental value. One day, I hope to have a tree with all handmade ornaments! 12. Can you ice skate? No. Two words- weak ankles. 13. Do you remember your favorite gift? I remember being excited about certain gifts.... 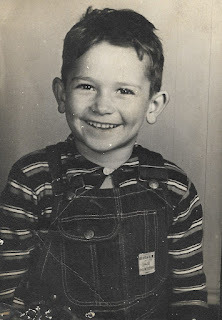 I have a picture of me when I was about 3 or 4 with a little train I wasn't expecting to get. You can tell by my face I was thrilled! 14. What is the most important thing about the holidays for you? I always take time to read the story of Jesus and remember WHY he was born. I love the song "The Angels Cried"... especially the part that says, "the Angels knew what was to come; the reason God had sent his Son from up above... it filled their hearts with joy to see, but knowing of his destiny, came tears of love...."
15. What is your favorite holiday dessert? FUDGE!! 16. What is your favorite holiday tradition? Ever since I can remember, the menu for my family's Christmas gathering has always been- homemade Hot Tamales and chili- YUMMO! 17. What tops your Christmas tree? An angel. 19. What is your favorite Christmas song? "What Child is This"... I also love "Silver Bells"- that was my Momma's favorite. 20. Candy Canes. Yum or Yuck? Yum, but only the peppermint kind- I don't like the cinnamon or fruity ones. 21. What do you want for Christmas? I would love to have a nice coffee pot, since my other one conked out and the $12 dollar one from Wal-Mart I replaced it with smells like it's on fire when it brews. 22. Do you attend an annual Christmas party? No. 23. Do you dress up for Christmas Eve or wear PJ's? Are you kidding? Pajamas all the way! 24. Do you own a Santa hat? Ummm, I think I do- it's probably buried in a box of decorations somewhere. 25. Who do you normally spend Christmas with? Mine and Hubby's families. I think my favorite Christmas song is the one by Faith Hill- Where are you Christmas. It's on The Grinch. Ooooh I forgot about that one, Jen... that is a good one!! I love the rooster! I'm going to comment on number 14. What is the most important thing about holidays for you. First, be thankful for all our friends and family that are near and dear to us. Second, it is wonderful to give and receive gifts,(the anticipation of what all those presents are under the tree has on numerous occasions gotten us up in the weeee hours of the morning) however, it is also important for us all to remember Christmas as the birth of Christ. Hello Miss Paula!!! As I grew up and well into my early adulthood we would always go to the candlelight service at our church and the song (which became my favorite because it carries so many fond memories) Oh Holy Night would be sung by the same man every year......even at a young age it moved me to tears.... thinking about it makes me a little tearing....It carries such a strong message and when I think of what my Sweet Saviour Jesus has done for me I can not help but be filled with an enormous amount of gratitude and love. Thank you for sharing....have a GREAT DAY!!! Open presents on Christmas Eve or Christmas Day? Husbands family opens theirs on Eve and my family always opened on Day. This is fun! I will probably copy your idea at my blog. My fav. Christmas songs are Have yourself a merry little Christmas, White Christmas and Where are you Christmas. I love the Christmas rooster! I will have to copy your idea. Colored or white lights? Always has been multi-colored. Mainly because my kids (now adults) tell me to do it that way. They say the white lights are year round. What do they know!?! I LOVE reading more about you on your Christmas Tag!! Fun!! Hi Paula! Thanks for the inspiration - my blog now has a post of the Christmas Tag questions. I had fun answering it! How fun to read all the things about you! As for me (#23)...I'm in my pj's the entire day! Oh, the comfort of being comfortable!!! I enjoyed learning more about you! I will answer #7. My favorite holiday memory as a child is getting handmade beautiful barbie clothes and baked goodies in the mail from my grandma who lived in Pennsylvania! Just wanted to say that Hamburger looks cute in his little Santa hat! That's the cutest rooster I've EVER seen! I'm having a giveaway on my blog, Paula, so come on over and join in! Paula is that a picture of hamburger with the santa hat on? I like your answers...my favorite Christmas song is I'll be Home for Christmas...it's sentimental to me because of my son being in the military years ago and he was always away for Christmas. I still tear up when I hear it played on the radio because I think of all the military men and women away from their families. I may copy this to my blog in a couple of days! We've had 3 really bad coffee makers in a row. Not long ago, I heard an advertisement for a Hamilton Beach 12 cup brew station. LOVE IT! No pot, just push your cup and fill it up. Coffee tastes better longer not sitting in the pot baking and no drips from a leaky pot either. Google it on Amazon. Loved your post today. Hey Paula, #13 my favorite toy was the Barbie head that you could fix her hair and do makeup. Well, that was until my sister gave her a haircut. I did this one as an email. It is alot of fun remembering all this stuff. Our whole family used to go to midnight mass, even after it was changed to 10:00 and still called midnight mass. My favorite song has always been 'Silver Bells', since we sang it in 6th grade at out Christmas program. My fave gift was a teddy bear my Grandma Young made for me when I was about 3. It was in a piece of luggage that was lost or stolen during a trip in 1982. We don't have any specific 'meal' at Christmas but I simply adore the teacakes my Grandma Fraise always made for us. In fact, I make them for everyone now that she is gone. I have never missed Christmas with my parents in my life. We don't exchange gifts as adults. We all buy for the kids. I prefer gift bags--neater and cheaper. 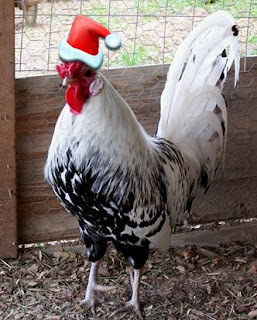 Love the santa hat on the rooster!!! Stop by and visit sometime! Have a great day!! Hi there! 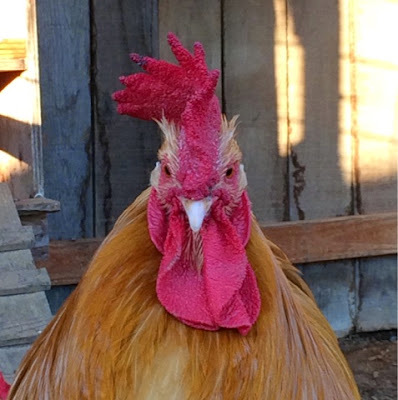 I saw your comment on a recent blog and your rooster photo caught my attention! I LOVE everything roosters and have a rooster kitchen! Of course I would love a real one, but that will have to wait until we can get our home owners assoc. to approve of my husband building a chicken coop! :-) I look forward to coming back and reading more about your life! Definitely egg nog! I esp like the Southern Comfort brand egg nog. It's non-alcholoic but full of awesome! I played along on my blog! So fun to learn more about you. I love so much about the holiday meals, but the deserts are the best, and fudge tops that list. YUM! I love having our families traditional decorations too. But, I would like to have all new (vintage, but new to me) tree decorations some year. That was great! I really enjoyed getting to know the Christmas side of you. Thank you for sharing! I love your Rooster in the Santa Hat! Thanks for sharing! That was fun! Neat peek into your Christmas life! Paula, that picture has to be one of my favorites....LOVE that Rooster! My favorite Christmas Song- that's a tough one- I love Christmas music. Today my favorite is "Some Children see Him." Hi Paula! I took the tag and made a list and checked it twice, but still can't get the darn Blogger to space it right! hahaha Stop by and read my post when you get a chance! Thanks for the "tag"
A great tag!! Had fun reading it..laughing all the time while looking at the Santa Rooster!! I hadn't looked at my chickens/rooster with dressing them in mind! Hmmmmm? That might be fun to think over!! Hi Paula, I love your Rooster with the Santa Hat. So festive! I just loved reading your tag!!! I thought it was funny that you like cornbread dressing best -- I wonder if it's a Southern girl (I mean "Belle") thing? We love our cornbread dressing, here, too! How fun! I always love reading more about you, Paula. You make me laugh. Let's see ~ #8 ~ when did I learn about Santa Claus? It was night when my aunt said, "Look! Up there in the sky. Can you see his sleigh and reindeer?" I said, "Yes, I see it!" And everyone commented about it while I stood and there and knew that there wasn't a thing up there but the moon! LOL That was night I knew. I think I'll do this tag tomorrow too. What fun! Loved this post, and the previous one too...I'm with you on the fudge! Have a Merry Christmas. Hope you get some snow! Another tag awaits you over at my blog. It's a very simple and easy one!! Promise! The rooster is just so funny!! I enjoyed reading more about you, glad you shared.